Houston Police Department: 212 Record Breaker! My name is Domenique Devito and I am a Police Cadet in Academy Class 212. It is an honor to be part of this class and I truly know what it’s like to be part of the “HPD family.” These are my classmates, friends and soon to be brothers and sisters in blue. We graduate in June. I can’t wait to hit the streets. 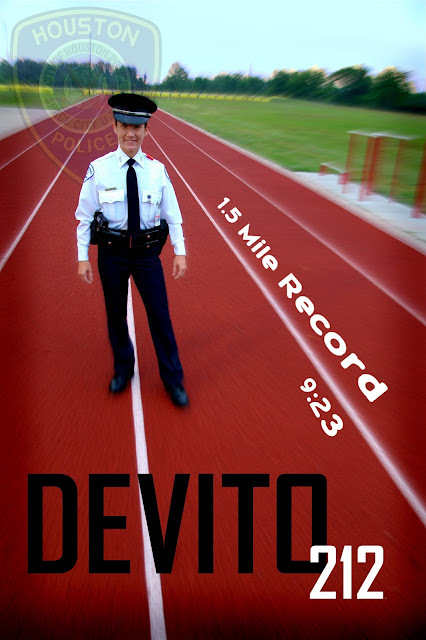 I recently broke a long standing record for the mile and a half run at the police academy during my final physical training test. 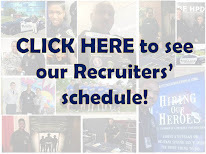 I didn’t run very much prior to the academy until I started attending the “Run With Your Recruiter” events that the Recruiting Unit conducts on a regular basis for police applicants in the process or for people who are just thinking about becoming a police officer with HPD. As far as breaking the record, I couldn’t have done it without my class cheering me on during every lap. Even my classmates who were running on the other side of the track were cheering me on. They all wanted to see me succeed. When you have motivation like that, it pushes you even further. The previous record for the female mile and a half time was 9:48. As I finished to the cheers of my classmates and instructors, I knew I had broken the old record, but I was very surprised and pleased to see that my time was 9:23. The whole process from recruiting to the academy has been quite the experience, one I shall always remember fondly. 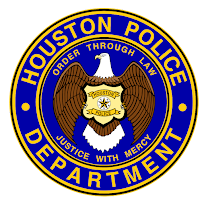 I can’t wait to start the next chapter in my life next month as a patrol officer for HPD! Speedy! I feel sorry for the crooks who think they can outrun you!